The Wirral Peninsula is situated between the Rivers Dee and the Mersey, overlooking the Welsh Hills to the south west and the distinctive Liverpool skyline to the north east. The Wirral is mentioned in the Anglo-Saxon Chronicle as Wirheal, meaning "myrtle-corner", deriving from the Old English word wir, a myrtle tree, and heal, an angle, corner or slope. The area has a rich Viking heritage, the Vikings began raids on the Wirral towards the end of the ninth century and began to settle along the banks of the River Dee and the coast of the Irish Sea. They introduced their own system of government holding a parliament at Thingwall. The Irish annals record the population of Wirral by Norsemen led by Ingimund, who was expelled from Ireland around 902 and obtained agreement from Aethelflaed or "Ethelfleda", ruler of the Anglo-Saxon kingdom of Mercia and sister to King alfred the Great, which allowed them to settle there peacefully. The boundary of the Norse colony is believed to have passed south of Neston and Raby (deriving from the Old Norse Ra-byr, which translates as 'boundary settlement'), and along Dibbinsdale. The village of Bromborough, on the east of the Peninsula, is a strong candidate for the site of the epic Battle of Brunanburh, a great English victory over the Vikings. The battle was fought in 937, by an Anglo-Saxon army under the command of Æthelstan, King of England, and his brother Edmund against the combined Viking armies of Olaf III Guthfrithson, the Norse-Gael King of Dublin, Constantine II, King of Scots, and Owen I, King of Strathclyde. Brunanburh has been called "the greatest single battle in Anglo-Saxon history before Hastings. The name derives from Old English Brunanburh, which means 'Brun's fort'. While doubt will always remain as to the location of the battle, the evidence of history, folklore studies, and literature all suggest Bromborough to be the most likely contender. Although the precise location on Wirral for the main battle site is not known with certainty it is thought that the thick of the fighting could have taken place in the Bebington-Brimstage region. Evidence of Norse settlement in Wirral can be seen from its place names, such as the '-by' (meaning "village" in Scandinavian languages) suffix, which is common in the area i.e, Helsby - hjalli-byr village at the ledge, Raby, from the Old Norse ra-byr meaning boundary or border settlement, Frankby (Franki's settlement), Greasby (wooded stronghold). Tranmere comes from trani melr ("cranebird sandbank"), Meols derives from the Old Norse for sandbanks or sandhills. West Kirby, or West Church Settlement, the settlement of Vestri Kirkjubaer in Iceland has exactly the same name, which translates from Icelandic as West Kirby. The Wirral boasts a number of picturesque villages, the pleasant village of Brimstage has a craft centre housed in a medieval tower. The large village of Bromborough, which is mentioned in the Domesday Book, is a candidate for the site of the epic Battle of Brunanburh, a great English victory over the Vikings. An Anglo-Viking preaching cross dating from around the tenth century stands in the churchyard The picture postcard village of Burton (pictured right) stands on the estuary of the River Dee, recorded in the Domesday Book of 1086, it boasts a number of quaint thatched cottages. Port Sunlight is argued to be the finest surviving example of early urban planning in Britain. The late 19th Century village was built by William Hesketh Lever (later Viscount Leverhulme) to house his soap factory workers at Lever Brothers. The charming village Shotwick (pronounced `Shottick') is situated on the southwest of the Wiral Peninsula near Ness, the red sandstone village church of St. Michael's dates back to the beginning of the 12th Century. 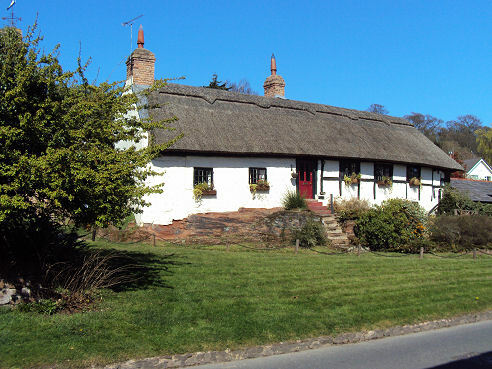 Thornton Hough has a spacious village green around which group a cluster of quaint cottages, a church, a manor house and a smithy, and amply demonstrates that a modern planned village need not be soulless. Four of Wirral's beaches are mentioned in the Good Beach Guide 2012 - West Kirby, Meols, Moreton and Wallasey are ‘recommended’, the guide’s highest accolade. The town of West Kirby contains an elegant Victorian promenade, which is flanked by a marine lake, which has views out to Hilbre Island and the Dee estuary into North Wales. The views across to the Clwydian Mountains are superb on a clear day. At low tide it is possible to walk to Hilbre Island which is cut off from the mainland by the tide for up to four hours out of every twelve. Amenities for windsurfing, sailing and kayaking are available on the lake. Wirral Country Park was opened on 2nd October, 1973, and was the first country park to be created in the UK. The park is based around the Wirral Way, a footpath which traverses the track bed of the former railway route from West Kirby to Hooton for twelve miles (19km). The railway closed in 1962. The park is large and diverse enough to absorb a wide variety of activities, from walking, riding, cycling, running, birdwatching, picnicking and barbecues. A number of access points, view points and picnic sites along the length of the park allow for short circular or longer linear walks, with good public transport links at either end of the Wirral Way and at various points in between. Large areas of land on the Wirral are owned by the National Trust. 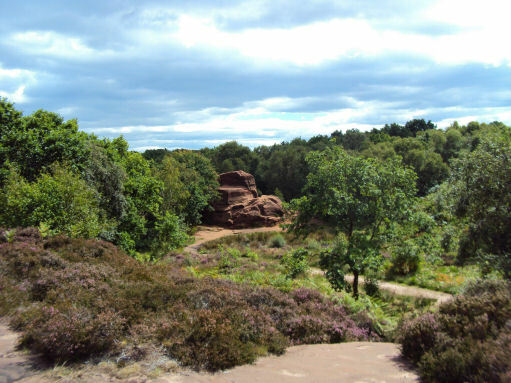 Among the areas of open land are Bidston Hill, which consists of around 100 acres of heath land, woodland and sandstone outcrops that contains several historic buildings and mysterious historic rock carvings. Brotherton Park and Dibbinsdale comprise an area of over 80 acres (320,000 square metres) of park and woodland along the valley of the River Dibbin. Located between Spital and the village of Bromborough, the valley woodland is a fine example of ancient woodland and is a Site of Special Scientific Interest and once formed part of the Royal forest of Wirral dating back to the end of the last ice age. Caldy Hill, which boasts superb views views over the Dee Estuary to Hilbre Island and the Irish Sea with more distant views of the mountains of Snowdonia to the west and and the Pennine hills to the east, Eastham Country Park, situated on the banks of the River Mersey, provides views across the tidal estuary with its abundant bird life and busy shipping lane. Hilbre Island is the largest of three tidal islands which lie at the mouth of the Dee Estuary. 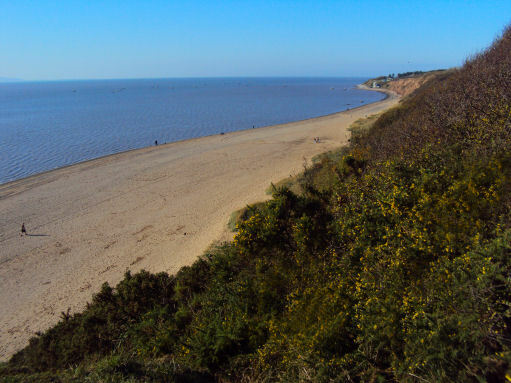 All three, Little Eye, Middle Eye and Hilbre, have been designated a Local Nature Reserve maintained by Wirral Borough Council and Thurstaston Common, (pictured above left) is a popular spot with walkers for the superb views, at just 90m above sea level, it offers some of the best the Wirral has to offer. The Common is a designated Site of Special Scientific Interest and is home to a variety of wildlife including dragonflies, common lizards, yellow hammer, linnets and meadowpipit, woodpeckers can also be sighted in the pine plantations. Beautiful Ness Gardens are part of the University of Liverpool and have won many awards. The garden's elegant landscaped terraces contain an outstanding collection of plants, shrubs and trees, with a particularly wide variety of rhododendrons and azaleas. The RSPB visitor centre at Burton Mere Wetlands provides birdwatching facilities,the Dee Estuary (above left) forms part of Europe's most important wetlands network for migrating birds. The estuary offers great days out, whether you're exploring wildlife-packed bluebell woodlands at Burton Mere, or taking a bracing walk along the beach at the Point of Ayr.